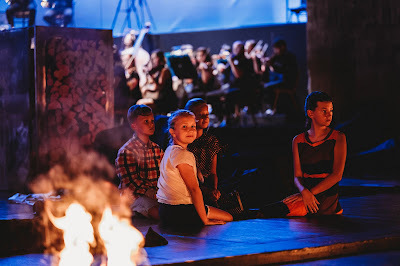 Our roving correspondent Tony Cooper experiences Wagner’s Der Ring des Nibelungen at the Tiroler Festspiele Erl in the Austrian Tyrol directed by Dr Gustav Kuhn with Susanne Geb, Magdalena Anna Hofmann, George Vincent Humphrey, Rena Kleifeld, Svetlana Kotina, Valentin Lewisch, Werner van Mechelen, Raphael Sigling, Andrew Sritheran, Nancy Weissbach, Wolfram Wittekind, and Gianluca Zampieri. That well-known English proverb ‘From Little Acorns Do Mighty Oaks Grow’ well describes the Erl Festival which was founded in a humble and unassuming way by director/conductor Dr Gustav Kuhn and dramaturg Andreas Schett in the small, idyllic and pretty Austrian Tyrolean village in 1997. An eager, energetic and charismatic conductor, Dr Kuhn has turned Erl (with a population of around 1400) into what could readily be described as an ‘Austrian Bayreuth’ and, like Bayreuth, it is set in its own Green Hill but here surrounded by a glorious mountainous landscape that simply takes your breath away particularly as you exit the theatre following an evening’s performance with the mountains, silhouetted against the vanishing night sky, acting as a realistic backdrop to Mother Nature. 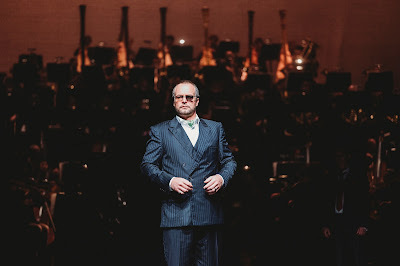 A Salzburger and an enfant terrible of the contemporary-music scene, Dr Kuhn made Wagnerian history in Erl when he presided over the world’s first 24-hour Ring in 2014. The following year the production found favour in Shanghai. Now aged 73, Kuhn - who studied music from the tender age of five - was destined to succeed in his chosen profession. He won the International Conducting Competition of the Austrian Broadcasting Corporation in 1969 and a year later completed a PhD in philosophy, psychopathology and psychology. Just the right credentials for Wagner! And to forge his career as a conductor, he studied under the Italian composer/conductor Bruno Maderna as well as Herbert von Karajan, another Salzburger. As his international conducting career blossomed, particularly in Italy, he decided to turn his hand to stage direction and producing in 1986. Therefore, he’s just the right man for the job at theErl Festival which, incidentally, opened in a blaze of glory with a performance of Das Rheingold in 1998. 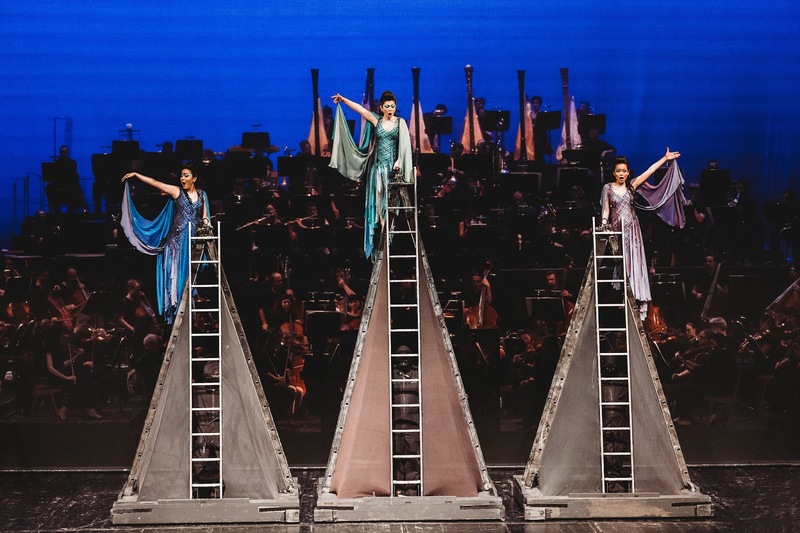 Over the past 20 years, the festival has matured and blossomed into a major international event not just for Wagnerians but for classical-music lovers, too. For instance, there’s a big focus this year on English composers with the programme featuring the Cheshire-born composer, author and poet, Cyril Scott, a man ahead of his time both in his music, thought and ideas. He’s widely recognised as one of the most remarkable men of his generation. Other English composers featured this season, too, include Britten and Walton while those two giant names of Italian music, Rossini and Verdi, also find their way on to the bill. 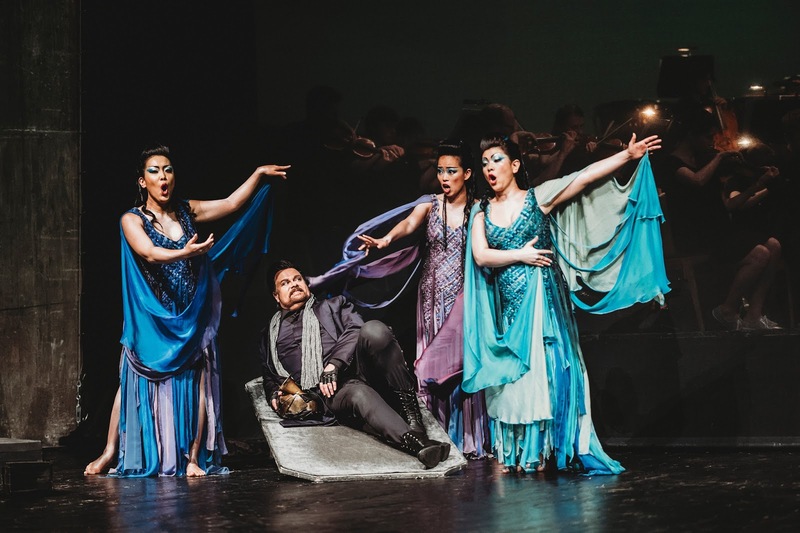 The programme at Erl, however, covers about 30 events over the summer period ranging from operas and concerts to chamber-music gatherings which are attended by more than 20,000 people each year. An annual winter festival runs, too, from St Stephen’s Day (26th December) through to the Feast of the Epiphany - Three King’s Day (6th January). But the seemingly-remote village of Erl - universally renowned for its ‘Passion Play’ - is not that remote, really, as it’s roughly an hour’s drive from Munich, Innsbruck (the capital of the Tyrol) and Salzburg. In fact, performances of the Ring actually takes place in the 1959-built Passionspielhaus and only used in the summer months because it has no heating capacity. However, the story of Christ’s Passion has been told and retold in this lovely Tyrolean village since the early 17th century and staged on a six-yearly cycle. The next ‘Passion Play’ - with a script by the renowned Tyrolean author Felix Mitterer and music by Wolfram Wagner - comes round next year with performances running from May to October. . Extraordinarily, the Passionspielhaus now has a relatively new neighbour by way of a radically-designed and centrally-heated Festspielhaus. Designed by the well-appointed Vienna-based architectural firm of Delugan Meiss, the venue opened its doors to the public in 2012 and offers seating for 732 complementing well the architecture of its close neighbour while the Passionspielhaus, constructed mainly in wood with a pre-stressed concrete stage area, has a seating capacity of 1500. Both venues enjoy good acoustics. . Surrounded by mountains, pastureland and those lovely traditionally-built Alpine wooden houses, the Festspielhaus - largely funded by the Haselsteiner Family Private Foundation who covered the lion’s share of the building costs of 36 million euros - stands proud within the natural environment of the area while its bold and striking black façade, comprising a geometrical complex of fibre-cement panels, is seen in striking contrast to the white-painted Corbusier-style curved façade of the Passionspielhaus. Without doubt, though, it’s a lovely and welcoming environment in which to enjoy the Ring and mirrors the same naturalism and beauty that one encounters at Bayreuth. 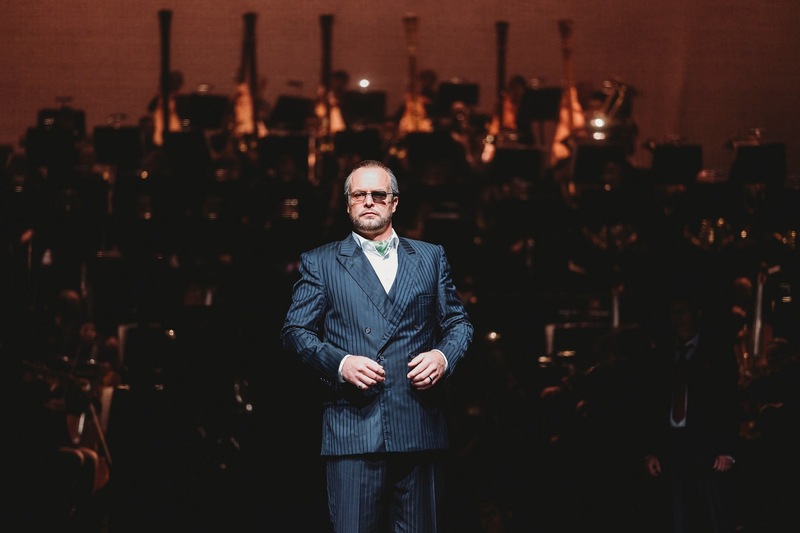 It’s no wonder, then, that the opera and classical-music fraternity of the region as well as a huge international contingent flock to Erl to hear Wagner. I’m glad to be one of them. However, the repertoire of the Festspielhaus mainly focuses on composers such as Bach, Handel, Haydn and Mozart as well as concentrating on the bel-canto repertoire and, indeed, other music of the Italian repertoire, for which the Passionspielhaus is not really suitable. And during non-performance times the Festspielhaus serves as a training centre for all opera-related matters. 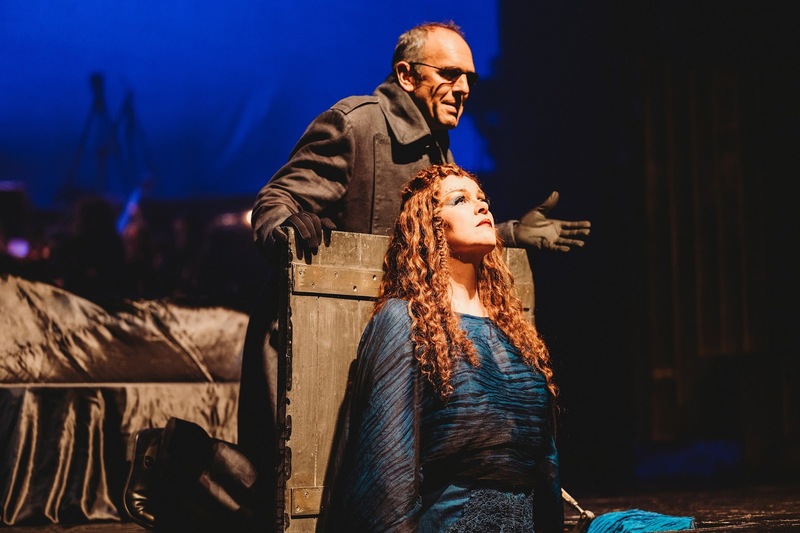 But opera (and the Ring, especially) is really what makes Erl tick and I found Dr Kuhn’s semi-staged production much to my liking and quite striking, too, especially with regard to the overall visual aspect of the production which was imaginatively planned. And to quote Wagner: Imagination creates reality. Indeed, it does! As there’s no pit at the Passionspielhaus, the orchestra’s located at the rear of the stage with the various sections placed on a series of steeply-terraced platforms while the half-dozen harps placed on the top tier could well have acted as a representation of the Gods’ heavenly home, Valhalla. Anyhow, I guess that’s one way of making sure that the orchestra does not overpower the singers. But that’s an old argument and one that I don’t really hold with. However, to give a division between the orchestra and the stage, a semi-transparent curtain is employed - and to good effect, too. Also, there are six large monitor screens placed across the front row of the stall area to give the performers their cues and so forth. With Wagner, of course, the orchestra’s just as important as the singers especially when it comes down to the Ring and its big production numbers such as ‘The Ride of the Valkyries’ and ‘Siegfried’s Idyll’ were magnificently played by an orchestra - recruited from here, there and everywhere much in the same way as Bayreuth - under Gustav Kuhn, a Wagner super-star for sure. The first-mentioned piece - heralding the arrival of Brünnhilde at the beginning of Die Walküre - was effectively used in Francis Ford Coppola’s movie, Apocalypse Now, as the soundtrack for a US gunship attack on a Vietcong compound and contained that famous line: ‘I love the smell of napalm in the morning.’ The latter mentioned, based on the final duet in Siegfried, witnessing the eponymous hero awakening Brünnhilde with a kiss, was never intended for public performance. Romantic to the core, Wagner wrote it for Cosima’s 33rd birthday in 1870. But in a moment of financial embarrassment, Wagner made a rash and hurried decision to allow it for publication much to the distraught of his dear wife who entered in her diary that ‘the secret treasure is now become public property’. 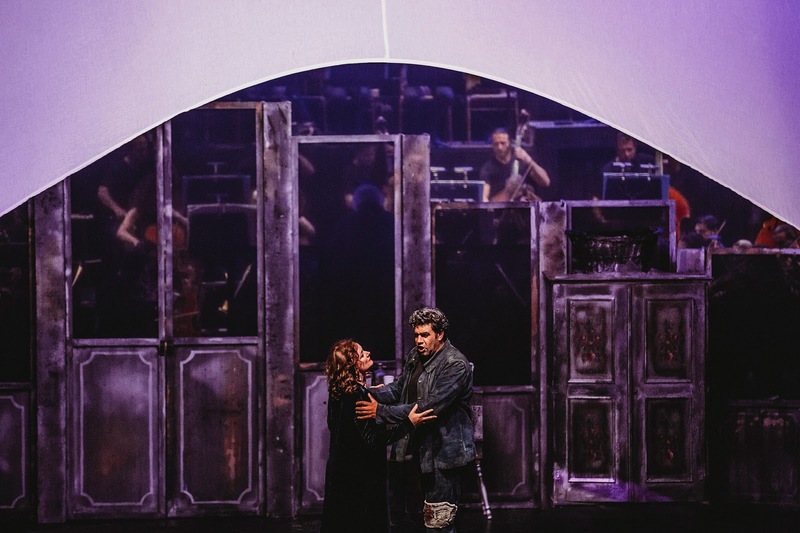 The visual aspect of the Erl Ring was satisfying and the mood of a particular scene was highlighted by a modest and ever-changing light-show enveloping the entire wall behind the orchestra. For instance, the colour chosen for the entry of the Rhinemaidens was a subtle purple and for the entry of the Gods into Valhalla a serene and misty reddish-orange while the scene with the dragon in Siegfried was, understandably, green - and so it went on. Yet another effective staging idea conjured up by Gustav Kuhn. And a semi-staged performance needs props that are practical, visually appealing and easily manoeuvrable and in this respect Jan Hax Halama duly delivered the goods. For example, the opening scene of Das Rheingold found the famed trio of Woglinde (Yukiko Aragaki), Wellgunde (Michiko Watanabe) and Floßhilde (Misaki Ono) prancing about on top of some very steep aluminium-built ladders constructed in a pyramidal shape thus representing the rocks of the Rhine while Alberich (superbly sung and acted by Thomas Gazheli with greed and avarice etched into his forced smiling face) fell in pursuit of their charms being chased round these contraptions worked with speed and accuracy by a team of stage technicians. The poisonous dwarf certainly got the full force of ‘Girl-Power’ by the Rhinemaidens who were well-turned out in bold-patterned long-flowing dresses designed by Lenka Radecky. In fact, Ms Radecky produced a rather good wardrobe for the entire cycle especially when it came to dressing the Giants. To make them look bullish, bulky and aggressive, she came up with a dream scenario. Fasolt (Franz Hawlata) came on stage in the guise of an American football player looking quite handsome in his gold-coloured shirt while Fafner (Andrea Silvestrelli) looked the part from top to bottom dressed as an ice-hockey player complete with stick and blue-and-white leathers and sponsored, to boot, by the German freight railway company, DB Schenker. They made a fine deuce. 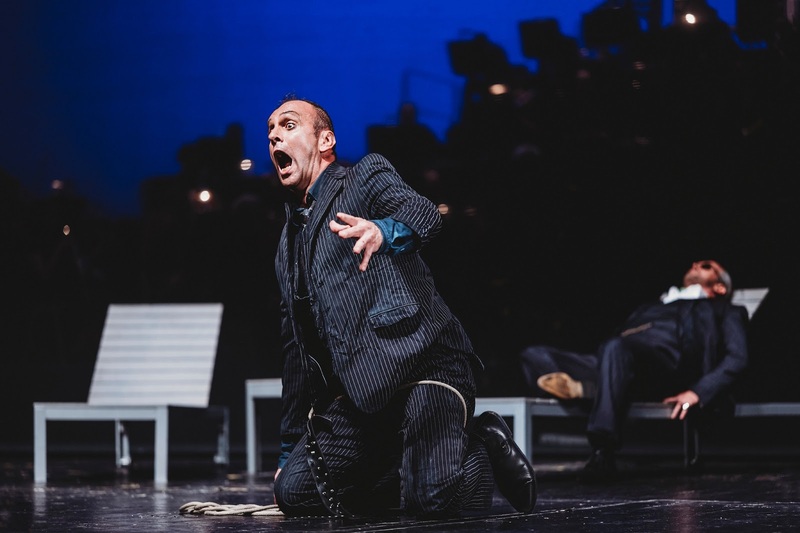 But one of the prizes of Rheingold is the scene when Wotan and Loge venture to the underground city of Nibelheim. How would this work in a semi-staged production, I thought? Well - it worked well. Five long metallic-looking beams placed either side of the stage were slowly lowered at various angles and with moody-lighting effects this was enough to offer a Gothic-like setting to Alberich’s dark domain of terror, pain and lifeless living. As usual, poor old Mime (sung by Giorgio Valenta) was seen getting the boot and soaking up all the pressure from his bullish brother turning him into a nervous wreck while the Nibelung workforce of slaves were suitably equipped with minors’ hard caps fitted with LED lights going noisily about their business of fashioning the gold on a string of anvils positioned in the two far aisles of the auditorium thus bringing Nibelheim to the edge of one’s seat. To add authenticity to the proceedings, there was even a smithy outside of the Festspielhaus demonstrating the art of his trade. A strong and articulate bass/baritone, Michael Kupfer-Radecky put in an authoritative and commanding performance as Wotan attired in a double-breasted dark-grey suit as befitting a politician or industrialist of stature while Fricka (Hermine Haselböck) appeared in a nice lightly-patterned summer dress. 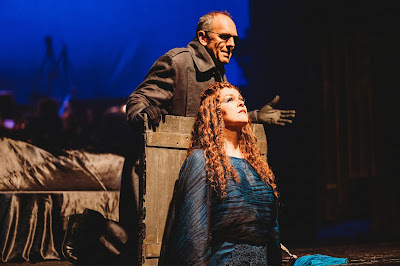 A mezzo-soprano with a good range, she played her part regally and refined as befitting a wife of a God but her reservations about her husband’s behaviour and actions was highly evident. However, in a moment of respite from world and domestic affairs they managed to find time to put their feet up relaxing on sun-lounges enjoying a cocktail or two in what proved a rare scene of blissfulness. Attired in a flaming-red dress, Joo-Anne Bitter put in a comfortable performance as Freia while Wotan’s running mate, Loge (Johannes Chum) looked quite fanciful, too, in red. A picture of sartorial elegance, the crafty old fireraiser sported red footwear with a necktie and pocket handkerchief to match and, possessing a bright clear tenor voice, he hit the bull’s-eye by delivering a colourful and striking performance. In Die Walküre, the role was undertaken by Valentin Lewisch. Looking an odd and eccentric couple, hammer-throwing Donner (Frederik Baldus) worked well with his brother Froh (Ferdinand von Bothmer) rigged out for a round of golf while Alena Sautier (Erda) excelled in her scene when warning Wotan of the evil and menace of ownership of the Ring. When you consider the tight budgetary restrictions and limited rehearsal time available it was, overall, a well-cast production by a relatively-unknown cast but it worked well and so did Raphael Sigling, sizzling in the beastly role of Hunding in Die Walküre. His preferred choice of transport was a motor-bike - hope it was a Harley Davidson! Aggressive, suspicious and selfish as ever, he arrived at his homestead complete with leathers and crash-helmet immediately demanding his supper with Sieglinde (Magdalena Anna Hoffmann) at his beckon call, uneasy and unsettled in the presence of her twin brother, Siegmund (Andrew Sritheran). The deuce proved a strong partnership and in their impassioned love duet at the end of the first act, a magical piece of staging literally unfolded to mesmerising effect when a long silk-looking white drape unloosened from the rafters and fell to the ground encapsulating the incestuous lovers in their final brace of ecstasy. 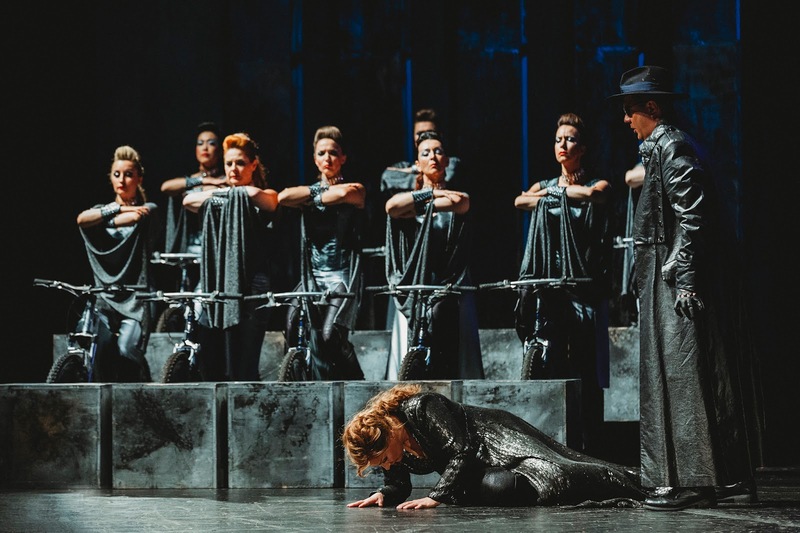 The second act of Die Walküre proved electric and found Russian bass-baritone, Vladimir Baykov, strong and comfortable in the role of Wotan while Susanne Geb put in an equally strong performance as Brünnhilde. Dressed in traditional equestrian gear comprising black riding-boots, hat, whip and a long-flowing dark coat, she looked ideal as an entrant for the Horse of the Year show! Wotan’s tête-à-tête with his long-suffering wife Fricka (ironically, the Goddess of Marriage) produced a riveting scene with Ms Haselböck (reprising the role) colourfully dressed in skin-tight red-leather trousers, a 1960s-style black-leather peaked cap and a pair of attention-seeking high-heel boots that limited her flow of movement on stage. However, she delivered an excellent reading of the role while landing into Wotan right, left and centre over his adulterous and incestuous affairs and jumped down his throat over his forbearance of the incestuous relationship between the Wälsung twins. The favoured choice of transport in this production was most definitely centred upon two wheels and not four legs. Hunding on a motor-bike and now the Valkyrie sisters on push-bikes - silver-coloured, too, complementing their silver-coloured garb. But three years ago, I understand, they were seen revving up on motor-bikes, too. Hunding must have been jealous! When they protested against Wotan’s decision to banish their heavenly sister Brünnhilde they screamed out to him from the bicycle parking-lot and then, in a more aggressive mood, set off on their bikes encircling him to distraction while trying to forcibly change his mind. He was having none of it and, calling it a day, they furiously pedalled off the stage in a flamboyant and colourful manner that nearly had the audience breaking into applause. 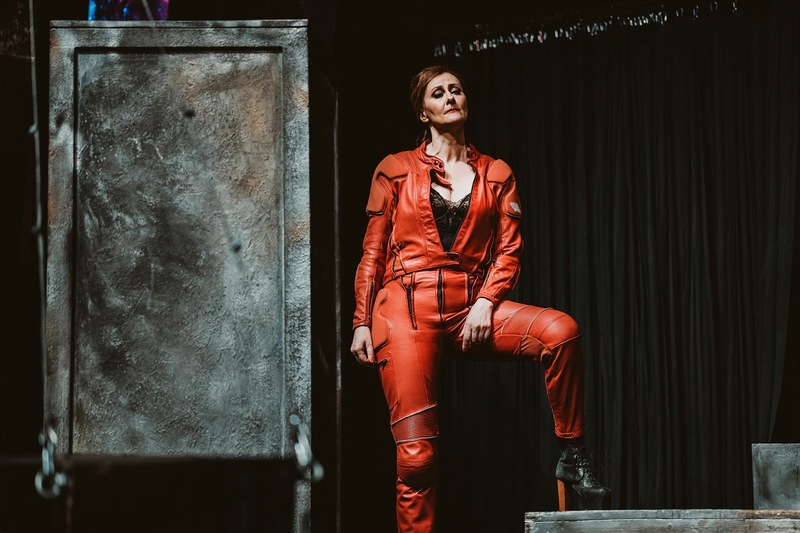 For Brünnhilde’s lying-in-state a red-flamed coloured stage did the trick but real fire is what the audience was really thirsting for. 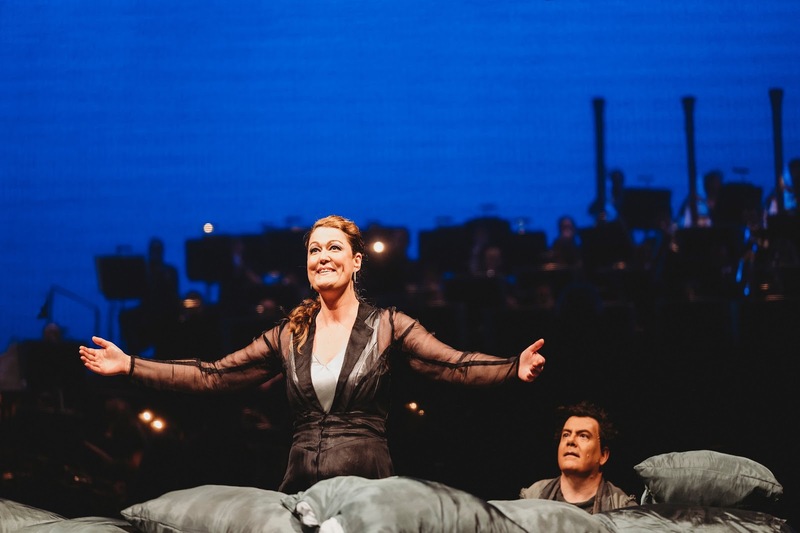 In the final scene of the opera in which Brünnhilde pleads with Wotan to keep her godly status it was a passionate affair and, indeed, passionately sung and acted by Mr Baykov and Ms Geb. But to give the scene that extra touch, the half-dozen female harpists came down from their lofty heights to the forestage and attired appropriately in red - the most pertinent colour of this cycle - played those final heavenly bars to thrilling and mesmeric effect as Brünnhilde takes to her burning rock (imagination was most certainly needed here) awaiting her big and challenging moment. And when that moment comes in Siegfried it was quite impressive, too. Plenty of fire was at hand - literally. Loge worked overtime, that’s for sure. Twenty torchbearers dressed in black processed through the auditorium using both of the central aisles and blazed round Brünnhilde’s rock with the ‘Prince of the Party’, Siegfried, standing by looking slightly confused and disorientated as usual in his quest for his bride. 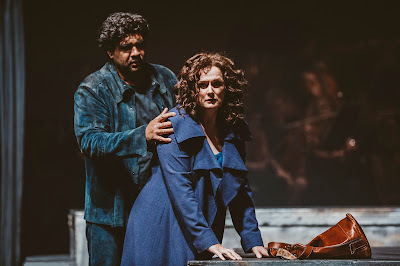 Nancy Weissbach was radiant in the role of Brünnhilde and Erl regular, Gianluca Zampieri, delivered a strong and confident performance as Siegfried. They put all their vocal technique and physical energy into the famous love duet in true Wagnerian style. The audience lapped it up. 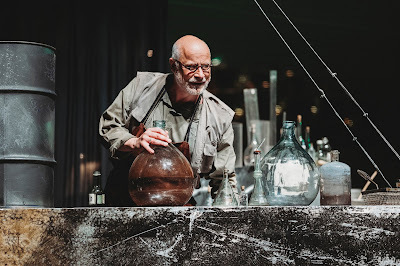 Wolfram Wittekind delivered a good reading of Mime in Siegfried holed up in a rather rundown forge kitted out with bare essentials and getting the jitters when Siegfried returns from the forest in tow with a bear. It was ‘pantomime’ at its best. And stacked up one corner of the smithy were several large oil-drums purchased, maybe, as a job-lot from Frank Castorf’s bicentennial Ring at Bayreuth. 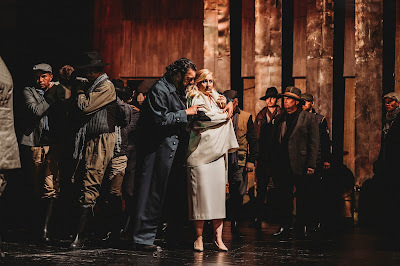 Joo-Anne Bitter (Freia in Das Rheingold and second Norm in Götterdämmerung) sung with clarity the Woodbird while Rena Kleifeld proved a good Erda singing from her earthly home - in this case, a stage trapdoor. And you wouldn’t get better casting than by the Russian mezzo-soprano, Svetlana Kotina, as Waltraute. 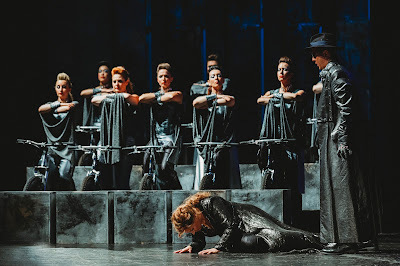 When she comes to warn Brünnhilde to return the ring to the Rhinemaidens in Götterdämmerung to end its curse, such a delicate and moving scene - another favourite of mine - it stamped her authority on the part while the flair and intensity of her performance is indelibly printed on my mind. 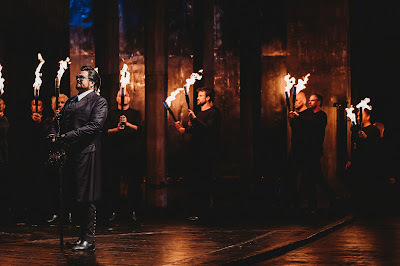 Michael Kupfer-Radecky (Wotan in Das Rheingold) and Susanne Geb (Brünnhilde in Die Walküre) clicked together as Gunther and Gutrune feeling the heat, intimidation and brute-force of Hagen crunching on an apple (one of Freia’s!) and chilling the air by his presence with the role so effortlessly sung by Andrea Silvestrelli (Fafner in Das Rheingold and Siegfried). His voice - deep, raw and menacing - was surely built for the part while resident cast member at Tiroler Festspiele Erl, George Vincent Humphrey, put in an athletic and convincing performance as Siegfried. 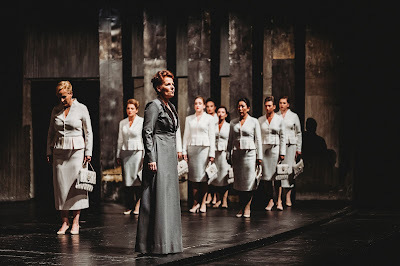 As this Ring was performed over four consecutive days, leading roles were, sensibly, shared, therefore in the case of Brünnhilde you had a trio of singers taking on the role with Bea Robin, the last of the bunch, seemingly on fire in Götterdämmerung. Anger and angst was written all over her face and in a determined and destructed mood she delivered the Immolation scene finely balanced on a stepped dais as if preaching from a pulpit letting rip knowing that lust, greed and corruption that encapsulates the curse of the ring is inextricably tied to it. 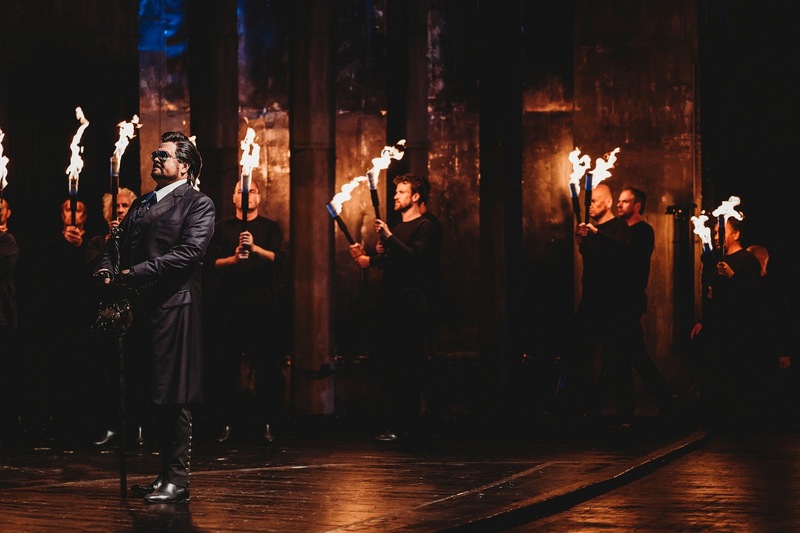 Therefore, to end the dreaded curse, she dramatically orders the waters of the Rhine to sweep over the fire - highlighted in this production by a team of eight flaming torchbearers standing firmly in line at the front of the stage - to wash away the vestiges of the ring. Following the aftermath, the Rhinemaidens were seen happy and joyful reclaiming their golden bounty and in the distance one witnesses Valhalla and the Gods engulfed in flames thus cleansing mankind of the curse of the ring while a small group of innocent children looked on in bewilderment, wonder and hope - hope for the future in an awakening of a new dawn. The end of the Gods, indeed, and, sadly, the end of this production which has been in the repertoire at Erl for the past 20 years. Hopefully, a new production is round the corner but to keep abreast of cultural activity at Erl, check out their website by visiting www.tiroler-festspiele.at.